The format of the traditional cooking show (show the audience the ingredients, cook the food, taste the food, tada!) is changing and has had to change because there are so many shows and the way we learn things is different now. Videos, online classes, social media, etc... All have to compete with a "boring" show set in one place, a kitchen set. Going to a real place and meeting real people and THEN coming for inspired by the visit is the way to go. That's exactly why I do the $20 Challenge. In this month's episode I challenged myself to create TWO MEALS for a family of four for $20. I got some online feedback that said "it really isn't a challenge to do one meal for $20..." and even though you and I know it is, I had to push my limits and go for the gold. 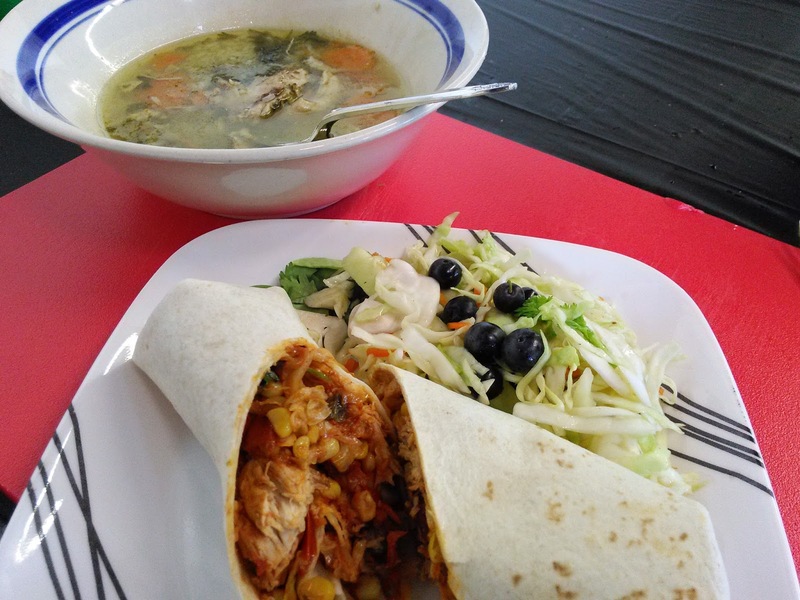 Come back tomorrow for the second set of recipes for CHICKEN BURRITOS with BLUEBERRY COLESLAW. 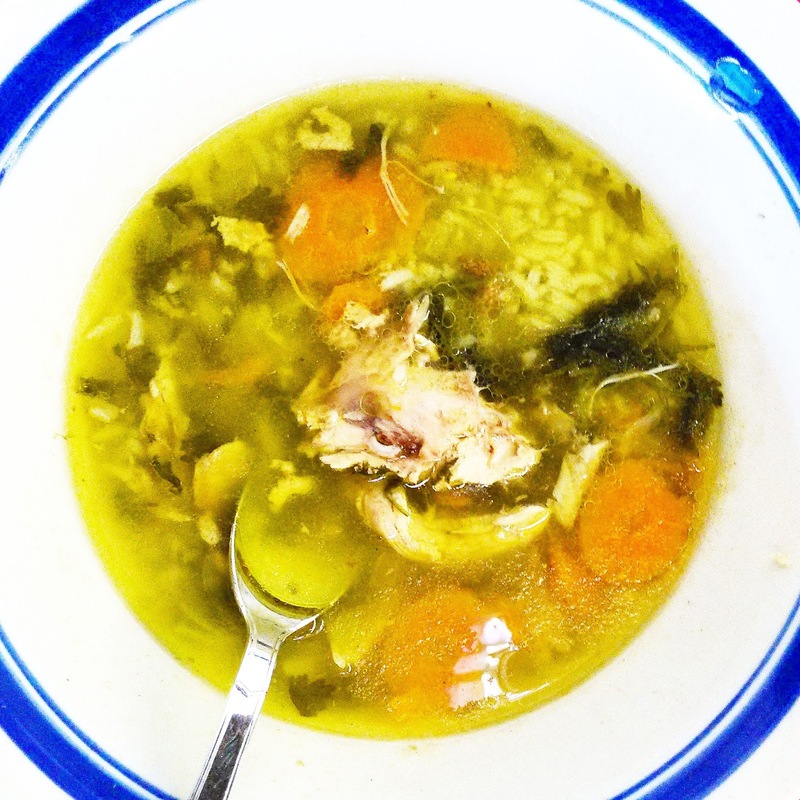 Today I'm posting the first dish, chicken and rice soup: chock-full of vegetables, herbs and a farm-fresh, antibiotic free whole chicken. Place the chicken, corn cobs, carrots, cilantro, garlic and seasonings in a large stockpot. Add 8 cups of water or enough to cover the chicken and bring to a boil. Normally at this point, you will have to skim the top of the broth to rake off the scum (ew, I know) and impurities. Because this chicken is fresh, pasture-raised and antibiotic free, that step is eliminated. Reduce the heat and simmer, skimming any foam on top, until the chicken is cooked through, about 30 minutes. 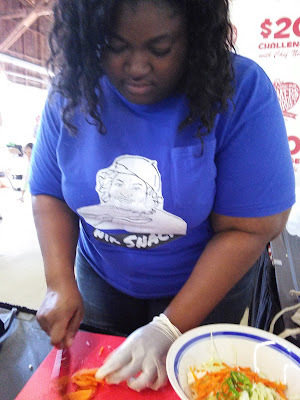 Transfer the chicken to a bowl or cutting board to remove the meat from the bones. Add the chicken back to the broth and add the rice to the pot. Simmer for an additional 20 minutes. Ladle into individual bowls. Serve. Come back tomorrow for the Chicken Burrito & Blueberry Coleslaw recipe! This is a great challenge and I'll bet a surprising one! Have fun at your demos! Such a fun challenge - and a great way to show that you can eat very well for not a lot of money! How much fun! I love the s up you created! Awesome job! I love how you took the online feedback and challenged yourself even more. Wow this is pretty cool! I think I'm up for the challenge! Such a fun challenge! This soup sounds amazing, I'd definitely make a double batch to feed my larger-than-four family! I think that is a great challenge to be a part of! Love the first dish you made! What a great challenge! You did an awesome job! What a great idea for a challenge! The chicken and rice soup looks like the ultimate comfort food. 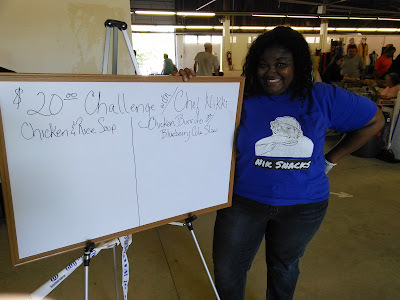 "it really isn't a challenge to do one meal for $20..." ??? what? Yes it is!! good job!